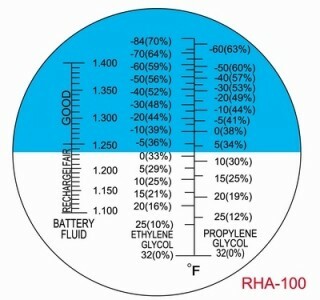 Battery Fluid Specific Gravity: 1.100 to 1.400 with “Recharge”, “Fair” and “Good” Ranges (0.050 Intervals) The scale is MUCH clearer than this scale depicts below! It will tell you the freeze point of your ethylene or propylene glycol antifreeze! It will tell you the concentration of ethylene or propylene glycol antifreeze in water by percentage! It will tell you the condition of your battery by measuring the Battery Acids Specific Gravity - the weaker the acid SG, the weaker the battery strength! Click the button below to add the Most Accurate Fahrenheit ATC Glycol Antifreeze/Battery Fluid Refractometer Tester RHA-100ATC to your wish list.